Holocaust Survivors: Photo Gallery - "Adolf Hitler at Rally"
Nazi party holds mass meeting in Buckeberg in 1934. 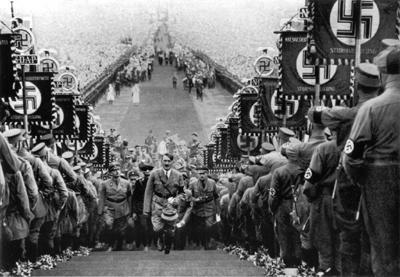 Other Nazi officials walk behind Hitler. This was one of the cigarette coupon photographs. Cigarette coupons could be redeemed for a series of photographs of Adolf Hitler taken by his personal photographer, Heinrich Hoffmann.